Large, easily adjusted mirrors using new instrument-quality glass and a special baked on a salt spray resistant backing. Mirrors have protective housing. The horizontal mirror is half-silvered. No adjustment wrenches required. Moulded from high impact, weather resistant plastic. 7" (178mm) frame radius Graduation from 120 degrees to -5 degrees Index mirror rectangular, 1.98" x 1.49" (50x 38 mm) Precision machined slow gravel gear and worm mechanism Highly visible, easy to read micrometer drum and vernier allowing readings to 2/10 minute if arc. 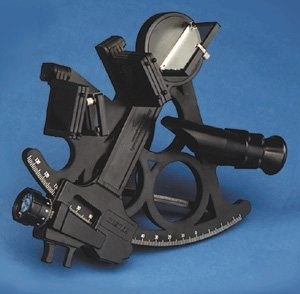 Fully ribbed, three circle sextant body for platform strength and stability Large, contoured handle designed for steady grip and angled back for added control Seven large sunshades allow complete, independent adjustments of shading density for horizon and index mirrors 3 x 27 mm star telescope with anti-reflective coated glass lenses, plus separate hooded sight tube for glare-free sun shots Neck lanyard frees hand and protects sextant tough, fully padded, shock-resisting carrying case with compartments for extra batteries and mirror kits. This item is available to order for delivery within 5-7 business days.